Soundwave is the most feared signal-stealer in the universe, and his Titan Master partner Soundblaster is a master of cyber infiltration. He drops a backdoor code into the systems of any bot he unites with, giving Soundwave a way in. With that access, Soundwave can raid any bot's processors -- completely undetected -- and steals a constant stream of information. 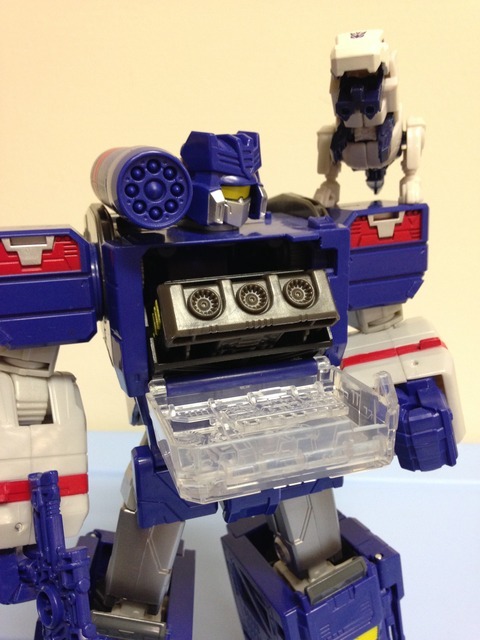 Soundwave’s alternate mode is that of a boom box – not one that uses cassettes this time around, but one that utilizes data pads/tablets. Huh, I never really thought that was odd until I wrote it. Soundwave has all the play, pause, forward, and reverse buttons you would expect from a cassette player, but you’re sliding in touch screen tablets… uh, well, we’re not going to talk about that anymore because his alt mode is pretty neat. Yep, it’s a big brick, and yep, it doesn’t really do anything, but you can open up his little loading door and pop in or out a number of appropriate pieces of technology. Soundblaster comes with a little rectangular, er, ship… thing that he jacks into, or you can use any of the aforementioned tablets/data pads (even Buzzsaw, but I don’t own him because I think he’s useless if you have a Laserbeak). The door pops open via a tiny button on the upper right of the boom box, and popping tablets in or out is a breeze. Well, that wraps up the functionality section… wait! You can peg his weapons into the back of the boom box! OK, now we’re done. As mentioned, the boom box is a big rectangular prism (or cuboid, if the internet is correct), which isn’t fancy, but is really all you would expect from such an item. The main color is blue with a transparent colorless deck door, some gold trim, and silver speakers. The look is just fine for the mode, but the whole deal is a little bland. I guess Soundwave is really shooting for deception. 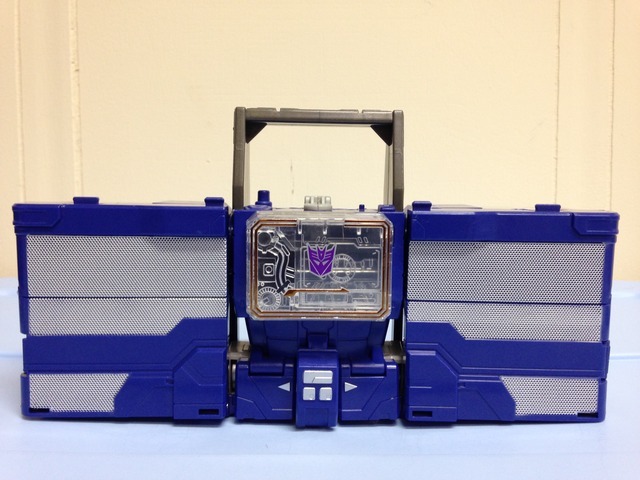 I suppose the main thing is that the boom box mode isn’t terribly jazzy, but it does what it needs to do – even if it is as big as Megatron’s tank mode. 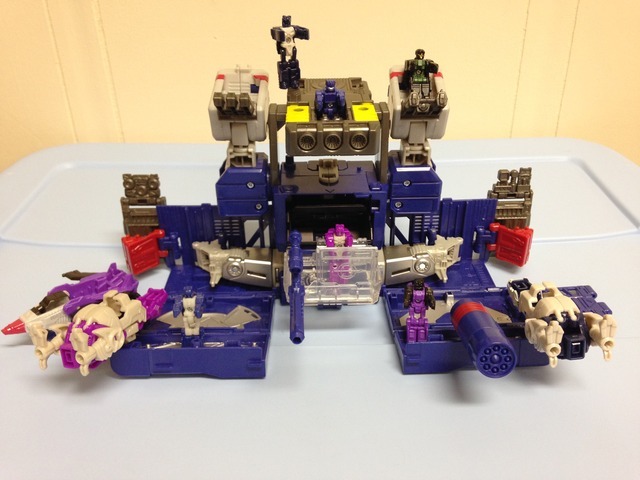 Getting to base mode is a simple affair – much simpler than Powermaster Optimus Prime’s base mode. All you need to do is start with the boom box, open up the leg panels and flip them down, then fiddle the arms a little until they point up. Adjust the feet a touch, and you’re almost there. Removing Soundblaster’s ‘ship’ allows for it to be tabbed into the carry handle, and the deck door is left open for some ‘digital displays’ to be flipped up (which is a real pain since the front one sits flat to the door – get something tiny and thin to help with that). Anyways, base mode is really awesome. There’s an absolute truckload of fun to be had with a small army of Titan Masters (though I realize that incurs more cost – but it’s worth it). I put six TM’s to snap a photo, and there is still space for more. There are little feet pegs all over, guns to be manned at various stations, and little ramps to help the little guys move in and out of the station. You can even take the mode and attach it to other Leader figures that have base modes like PM Optimus, Blaster, or Sixshot, and even Fort Max. As I understand it, you could essentially build a massive robot city from them all! Needless to say, I enjoy the base mode. Getting Soundwave into robot mode is also a simple affair, which basically involves folding all the leg panels into boxes and shifting things into proper positions. His helmet unfolds from a compartment on his back, and Soundblaster can be folded up and plugged in. When all of that is said and done, Soundwave looks pretty good. You can tell the chunky boxes of the robot were designed more for Blaster, but it works well enough as is. As you would expect, the main coloration is blue, with a little more grey in robot mode, dotted with red, silver, and a little yellow. Molded detail is done well, and even though Soundwave is a stacked load of boxes, he isn’t flat or boring. The whole aesthetic works really well, and I like it well enough. The helmet/head seems a little on the large size, but that seems to be a flaw of the design. It works great with Soundblaster, but unfortunately when you plug in a different Titan Master that is supposed to be a whole head instead of just a face, he ends up having a really tiny head with a double helmet. It’s unfortunate, as the play value would have been a little better – if you compare it to PM Optimus, the result is lacking. PM Optimus used the faceplate as part of the helmet, so you could use whichever TM you wanted and still saw the eyes. I wish they would have taken the same approach with Soundwave. Soundwave has a decent range of articulation, and nearly all of the joints are ratchet-style. Sadly, his wrists don’t move, but you can do enough with the arms to achieve most poses. The legs are sturdy and well jointed with large posable feet, so balance isn’t really an issue. The head swivels back and forth nicely, but it would have been much better with a little more freedom of movement. 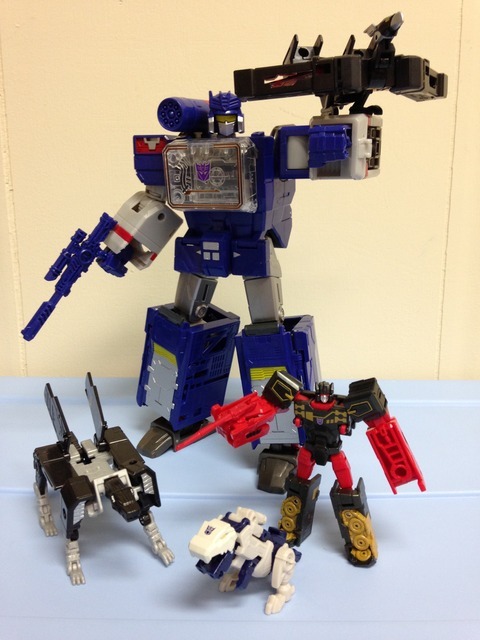 As previously mentioned, Soundwave comes with two weapons: his shoulder cannon and a rifle. Both are good, but not flashy by any means. If you have the ability to pair Soundwave with some of the Legends class tablets (or just one, even), you can have a good bit of fun with him in robot mode. By himself (with Soundblaster), he’s just OK. Getting the other parts really help out. 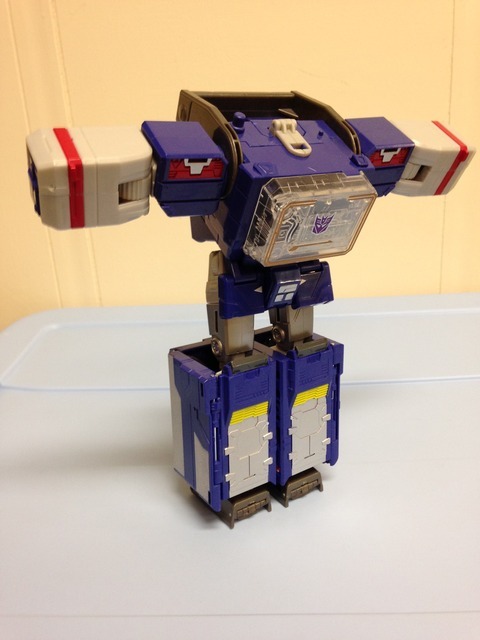 As some added fun, you can modify Soundwave's robot mode to produce a 'Lamp Post' mode. It's a fun nod to one of the early G1 Cartoon episodes (possibly the very first) where Soundwave disguises himself on Cybertron to do some spying on nearby Autobots. It's nonsensical and goofy. Try it sometime. There isn’t much to be said about Soundblaster. He’s your standard Titan Master all around – at least he has some paint! 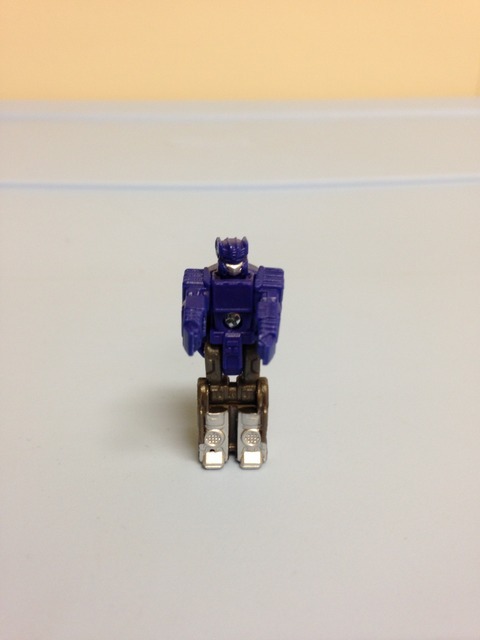 His upper body is done in blue plastic and he features a painted silver face. The legs are done in smoky grey plastic and the shins are also painted silver. 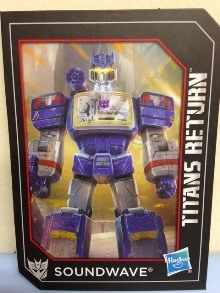 The molded detail is pretty good, and the design is done to mimic Soundwave’s general look. Soundblaster is nothing flashy, but he looks decent. He doesn’t work that well as a Titan Master on a different figure though. Transformation Design: 5. The design is that great – it’s really just a bunch of folding panels and shifting boxes – but it’s fun and simple for such a big loaf. Durability: 7. Overall he’s pretty sturdy, but there are some thin panels that could be worrisome. Fun: 10. I think the base mode synchs it. There’s just so much to do there, and if you have the ability to add some of the Legends class tablets, you’re really in business (fun business, that is). Aesthetics: 9. He looks really good all around. The boom box is slightly bland, and the head is a touch too boxy. Articulation: 8. I think he’s pretty standard. He’s not going to blow you away, but nothing is hindered and he’s sturdy in many poses. Value/Price: 6. He’s about $40-45 USD, and I think that’s fair for the size. If he came with a little more than just Soundblaster and his ‘ship’, there would be more value. Tack on the other things like the tablets and TM’s and the fun value increases linearly with cost. But that’s going to hurt your wallet if done all in one shot. Overall: 9. I don’t think you can really go wrong with Soundwave. He’s a boxy dude, and loads of fun. He looks good and he’s a classic character. As I wrote this up, I really tried to come up with negatives, and those issues are minor in the grand scheme of things. If you’ve got the funds and want to add some joy to your shelf, Soundwave is highly recommended.